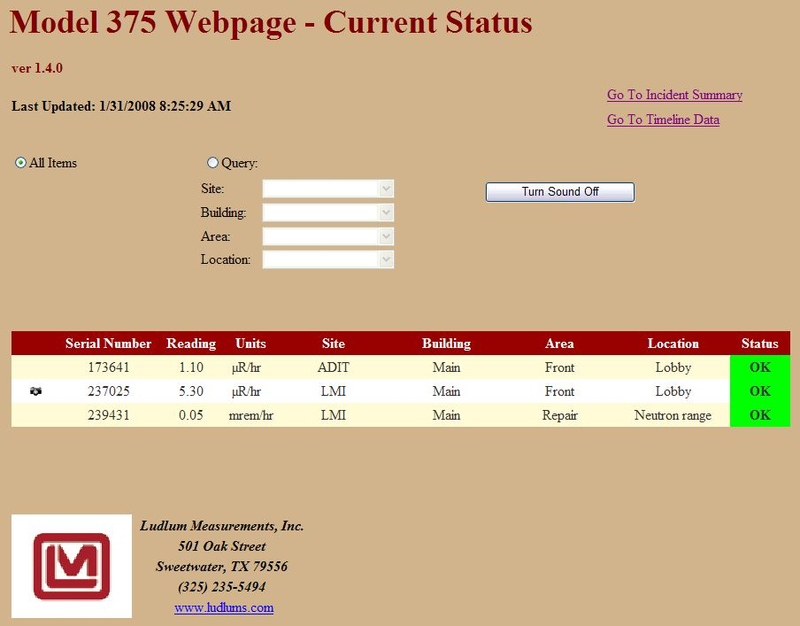 Sites requiring centralization of their data can link multiple 375 systems together via Ethernet and view them using a common web browser with the purchase of Ludlum’s Webpage & Service Software. This program collects all data in real time, logs data, and annuciates any alarms. The system can also send intelligent email alerts to responsible personnel and capture a picture of whatever triggered an alarm anywhere optional Ethernet cameras are employed. Here is a list of some popular, pre-configured systems utilizing the Model 375 controller. Contact Ludlum to receive a quote for a system best meeting all your needs. Model 375s equipped with the ethernet option can be connected to a radiation network that collects and displays radiation levels and alarm status in real time from up to 50 area monitors. A standard webpage browser with appropriate authorization can view all data across the network and audibly annunciate any alarms. The system can also be setup to send intelligent email alerts to responsible personnel and capture a picture of whatever triggered an alarm anywhere optional ethernet cameras are employed.